Candidates pursuing 3rd year of B.E./B.Tech./B.Sc. (Engg) or 3rd or 4th year of Integrated M.E./M.Tech. programme, 1st year of ME/M.Tech/M.Sc./M.A, MBA with outstanding academic background in terms of high ranks in university examinations are encouraged to apply. Note : IIT students are not eligible to apply. Application should be submitted online in this portal. There is no need to send hard copy to IIT Madras. 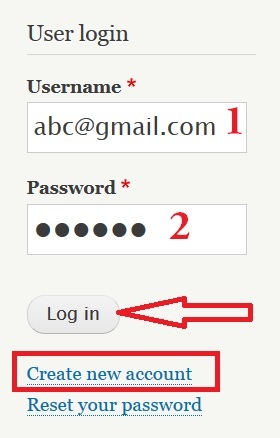 ** Use the link “Create new account” below the User Login button on the first page to create your login. ** A confirmation email will be sent to your address. Use the link in that email to confirm your login and to create your password. The email will be sent with the from address “sfp [AT] pallava.iitm.ac.in”. Watch out if this email lands in your spam folder. ** At any stage of application process, if you forget your login name or password, you can use your email address to reset your credentials using the link “Reset your password” on the front page. ** Login to this site time to time to check status updates and for any alerts on the recruitment process. ** Once you are logged in, you can see the online application form under the tab “My Application Summary”. You can use the links below each block in this page to fill respective forms. There are 2 forms that you need to fill in this page. ** Form linked as “Edit Profile” allows you to complete the details that appear in the block titled “Personal Details”. You can edit this page any number of times using the same link. ** Form linked as “Edit Academic Details” allows you to complete the details that appear in the block titled “Academic Details”. You can edit this page any number of times using the same link. ** Under this section, there are links to let you upload files for your passport size photograph, your Bonafide certificate (download template from home page), Academic documents (scan all documents in single PDF and upload) and Community, PWD (if applicable). The files will be labelled as per the link you chose to upload the file. Ensure that the PDF files are within the maximum size of the file upload of 2 MB. ** In this section, you can use the link “Submit Application” to choose a Department and the Area you are applying for in that Department – per user one application. ** Once you have completed all the steps above, you can click on the tab “Print Application” to download the PDF file of your application form and keep it for your reference (no need to send hard copy). The Last date for Online Submission is 28.02.2019 at 5.00 pm.